The Playstation 2 version of Vice City - Vice City Stories is the 2006 in stores and thus moves on the local PS 2. Some of the differences to Vice City is that you can abbreviate his mission clear way, by buying a helicopter for every hiding place. Furthermore, the way you can on the second attempt also shorten a mission ever. Another special feature in Vice City Stories on PlayStation 2 is that the players in the game can take over businesses. The cheat codes for Vice City Stories are entered with the Playstation 2 controller, while the game is running. In this Cheat List 15 active cheats are available. Will you have to improve your account in GTA Vice City Stories (VCS), is the cheat for 250,000 dollars (money cheat) just right. If you enter this cheat in Grand Theft Auto Vice City Stories on PlayStation 2 with controller, you have full armor once again. With this you can cheat in Grand Theft Auto Vice City Stories (VCS) provide full back for life energy (power) to the game character. Is that you wanted level in Grand Theft Auto Vice City Stories is too low, you can increase it with this cheat code. Decreasing the wanted level of Grand Theft Auto Vice City Stories on PlayStation 2 with this cheat code and you must not necessarily escape the police. This cheat also have bad vehicles in Grand Theft Auto Vice City Stories (VCS) is a perfect handling on the streets of Vice City. Also you can get an armored car in Grand Theft Auto Vice City Stories on the Playstation 2. Just give in this cheat code for the tank rhino. In Grand Theft Auto Vice City Stories for your Playstation 2 is a cheat code for a suicide to. Give in this GTA Vice City Stories Playstation cheat code and all passers near on you will attack you. This cheat code to get passants into your car is very usefull in the taxi mission and to get a co-driver. This cheat is to get an dump trashmaster truck for. Give in this GTA Vice City cheat code with you PS 2 controller and you will create the trashmaster truck ..
Is the gameplay in Grand Theft Auto Vice City Stories (VCS) is too fast you can slow it down with the following cheat code on the Playstation 2. 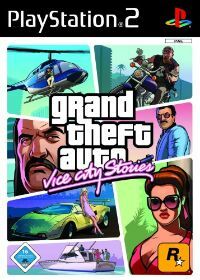 The gameplay of Grand Theft Auto Vice City Stories (VCS) on the Playstation 2 you can also accelerate. Increase the gamespeed with this cheat code. If you prefer a look in chrome, then you can in Grand Theft Auto Vice City Stories (VCS) and get all the cars with chrome finish. Here is the chromed cars ch..